STEPHEN M. WHITE and RODNEY HUDSON battled it out for the post of Los Angeles County district attorney in 1875. White was to serve as district attorney of this county and would go on to become a leading member of the United States Senate…but his election as D.A. was not to take place for another six years. 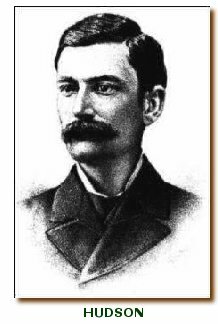 It was Hudson who won the 1875 election, later retiring to the bench in Lake County. The delegates took up other matters. Then, according to the Express…. Nominations were re-opened and delegates chose White, in absentia, over Will D. Gould, an advocate of prohibition. By the way, “Major Ross”—Erskine M. Ross—did not fade into oblivion. He served as a justice of the California Supreme Court from 1880-86 and as a judge of the U.S. District Court for the Southern District of California (in which Los Angeles was then located) from 1887-1895 and the Ninth U.S. Circuit Court of Appeals from 1895-1925. And from what far-off realm did this candidate hale? He was born in San Francisco—becoming in 1881 the first native Californian elected as Los Angeles district attorney. White moved here in 1874, setting up a practice in the “Downey Block” at the north-east corner of Temple and Main streets (then a prestigious location for law offices, now a portion of the terrain occupied by the U.S. District Court courthouse). And what was a “great register”? It was a list of registered voters with other information on the registering individual, varying from county to county, such as date and place of birth and occupation. White was, indeed, young, though certainly not so young that the newspaper’s reference to him by his given name was defensible. Born Jan. 19, 1853, he was 22. Hudson, a relatively obscure lawyer, was able to grab the Democratic nomination from a three-time district attorney, Cameron Thom. Thom—who two years earlier had courted the nomination of another party of fleeting existence, the People’s Reform Party—made no reference in his 1875 announcement to the Democratic Party. He thus did leave the door open to being the Independent Party nominee or running in the September general election with no party’s backing. Thom remembered the conversation differently. The delegates apparently believed Hudson. Graves, in the book mentioned a moment ago, elaborates on his assertion that Hudson was a poor excuse for a DA. Hudson apparently did not know the elements of crimes, enabling his law partner to pull a stunt that subjected him to ridicule. Judge Anson Brunson had been district attorney of Napa County. He was a very able man and a good lawyer. He had a little red ledger, in which he had written the form of an indictment for every crime known to the statutes up to that time. When Hudson’s first grand jury was to meet, he came up and borrowed this book from Brunson…. [Brunson] had, in his youth, peddled lightning rods in Wisconsin and could climb like a monkey. Hudson’s office was in the Temple Block, on the second floor, one floor below ours. One day Brunson watched him go to lunch, and he went into the adjoining office, which was open, crawled out the window, crept along the ledge of the building, entered Hudson’s office through a window, recaptured his little book, went out by the office door, which closed with a spring lock, brought the book up to the office and locked it up in our safe. The grand jury met and returned something like forty indictments. Demurrers were sustained to each of them. Hudson was very soundly reprimanded by Judge [Harvey K.S.] O’Melveny for his carelessness in drawing the indictments.